Direct link to the Slidecast is available HERE. Local copy of Slidecast content is available HERE. I am pleased to report that an abridged version of the talk I gave at the SME Nanosystem Roadmap Conference (containing one set of tooltip work being performed in collaboration with Eric Drexler and a second in collaboration with Robert Freitas and Ralph Merkle) is now available as a slidecast at nanoscienceworks.org. By way of introduction, I posted about nanoscienceworks.org previously when the 2nd Edition of the CRC Handbook of Nanoscience, Engineering, and Technology was published, as the nanoscienceworks site is managed by the handbook publisher, Taylor and Francis. Nanoscienceworks.org is an information-rich place for nano-researchers (where a biography of your truly is located), publications, and nano-related news aggregated from various sources. Slidecasts are steered PowerPoint presentations with associated audio, all in Flash format for universal playability (I think they’re more generally referred to as screencasts, but they may be new enough that you can call your own label). Unlike a typical research talk, you have time to meditate on verbal content before committing to mp3 format, quite handy when you tend to fly through concepts or find yourself inundated with new research ideas as you walk through the slides and then find yourself jotting notes and leaving long quiet spells in the audio. And if the possibilities of Slidecasts tickle your fancy and you want a thorough range of examples to steal, er, borrow presentation ideas from, I recommend heading over to Bioscreencast.com, whose “About Us” is cohabitated by none other than the good Dr. Deepak Singh. Click on the image to go to the Slidecast page. One revolutionary, and controversial, prediction of early nanotechnology research was the mechanical manipulation of atomic and molecular feedstocks, or mechanosynthesis. With laboratories now demonstrating atomic manipulation within covalent frameworks, computational chemistry is being employed for its predictive power in proposing and analyzing organic molecular frameworks capable of single-atom control and transfer. 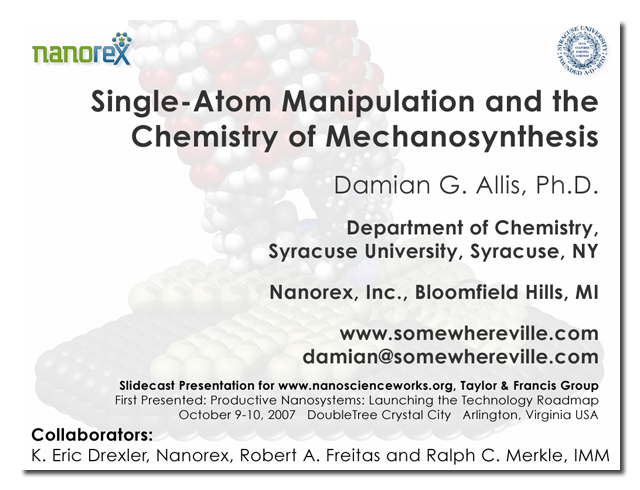 This slidecast on single atom manipulation and the chemistry of mechanosynthesis is presented by Dr. Damian Allis, Syracuse University and Nanorex Inc. If, by some chance, you want to link to the Slidecast, please do so directly from the nanoscienceworks.org site and not primarily from here. I would not have produced it without their request and, like any all-encompassing nano-related website, viewers will likely find their site far more useful and educational than this one. In the interest of time and space, I did reduce the size of the Slidecast presentation, leaving out a few slides that added some useful background but were not necessary to the overall scope of the talk. Just for the official record, I’ve included three additional slides and associated text from the original talk in the non-audio copy of the Slidecast sitting in somewhereville. To the content in the slidecast one might find useful additional information in Chris Pheonix‘s CRNano Live Blog of my talk. Questions or critique, I’d be very interested in any comments anyone has. The field gets pushed forward with discussion and debate, so the more feedback the better (either as comments below or in emails which, if interested, I’ll then post). …and if it were not enough to have his mechanosynthesis-affiliated self in the slidecast category, Robert Freitas received double billing for December with “Australia-U.S. Team Designs Test Bed for 3-D Nanorobots,” a post reporting his upcoming (January 2008) article in the journal Nanotechnology.